The Education department of Amador Community News. "Let's Build with our Hands!" 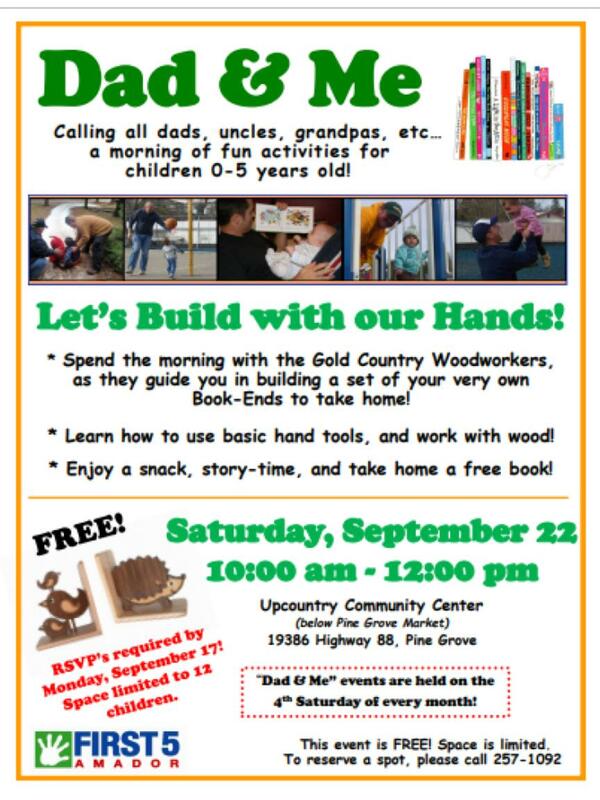 Spend the morning with the Gold Country Woodworkers, as they guide you and your child in building a set of your very own wooden book-ends to take home! Learn how to use basic hand tools, and work with wood! Enjoy a snack, story-time, and take home a free book! RSVP's are required by Monday, September 17. Space limited to 12 children. This event is free, and open to all families with children aged 0-5! To reserve your spot, please RSVP at 257-1092. Copyright © 2007-2012 Carol Harper. Simple theme. Theme images by duncan1890. Powered by Blogger.